Evan Lavigne is a cop in Taunton, Massachusetts. 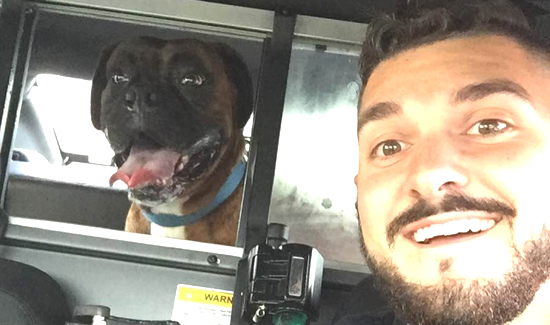 They call him the “dog cop.” But Lavigne’s not a K-9 handler. He’s more like dogs’ best friend. The 25-year-old cop told the “Today Show” recently that he’s now known for reuniting lost dogs with frantic owners. It all started when he was finishing up a night shift with the Taunton Police Department in Massachusetts when a call came in. A dog had been found wandering the streets and needed to be picked up. Lavigne, who found another lost dog the week before, headed over to take the pooch to animal control. The dog liked Lavigne immediately and jumped right into the back of the cruisers. So now Lavigne had a problem. His shift ended at 8AM and he was working a double. “He was one of the friendliest dogs I’ve ever met. I asked the gentleman who runs our Facebook page if he might be willing to put the photo on there … even if the owner wasn’t following us, his family or friends might be.” The post worked. Animal control was able to locate the owner. But first, they took a selfie. That dog was reunited with its owners too. Mark Lopes commented, “Thank you for finding my dog—he is home.” Lavigne has since become the agency’s go-to guy for lost dogs. “If it were my pet, I would want someone to make sure he was OK and that someone would take care of my dog until I was able to find them,” he said.